If you've got an Android phone or tablet that's got Android 4.2.x and you're not using DashClock Widget you are, quite frankly, doing it wrong. A fantastic new entry from Android Engineer Roman Nurik hit the Play Store. It's called DashClock Widget, and it's one of the cleanest, best-integrated widgets we've ever seen, And the app that turns the Jelly Bean lock screen widgets into more than just wishful thinking -- by the way, it's already in the 50,000 to 100,000 download range, and we'd be willing to bet it's on the high end of that -- got an update to version 1.2 today, bringing with it a number of improvements. If you have a device running Android 4.2 or higher, I can’t recommend DashClock enough. There’s plenty to customize in DashClock — which Gmail accounts to display the unread count for, how the clock looks, how the date’s displayed — and the widget itself changes the way information’s displayed based on the device you’re using. On the Nexus 4, you can swipe down on DashClock to expand it. On the Nexus 7, it’s auto-expanded. First up are some new visual tweaks, allowing for custom opacity, as well as the ability to center the clock. You also can assign application shortcuts to the weather and clock widgets. Nice. 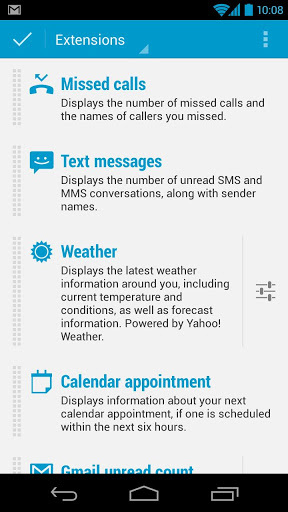 Then there's the addition of extensions for missed calls and new text messages. Or perhaps you'd be interested in support for French, German, Spanish and Russian. Use Microsoft Exchange for your calendar? It's now supported. Some of this is tucked into a new "advanced" menu, so dive into the settings to see the new features. 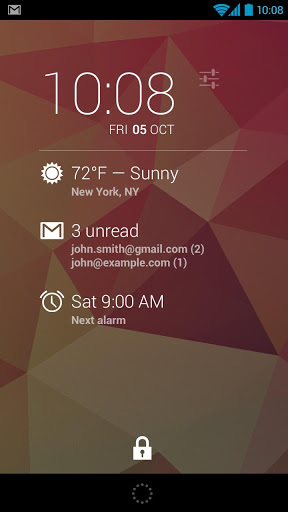 To download DashClock from the Google Play store, for free, use the download widget below.